Look like a genie in this whimsical ice skating dress. 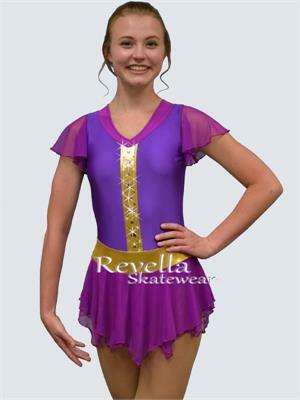 Purple and magenta spandex with gold metallic spandex 'belt' and bodice stripe. Short, flutter sleeves in magenta mesh. Full-style ice skating skirt has handkerchief hemline with multiple points. 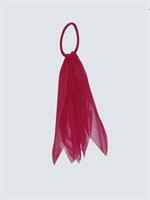 Ice skating skirt has two-layers of magenta mesh. Magic is in the air! Perfect for genies, middle-eastern music, or skaters who don't like a bare midriff. Ice skating dress shown in purple & magenta. Also available in magenta & purple, and turquoise & magenta. Want a different color? Simply choose 'custom colors' from the drop down menu, then select the color you want from our optional color choices below. Optional colors are available on all of our ice skating dresses. Search terms: short sleeves, genie, competition ice skating dresses, ice skating dresses.